Can anyone name me the swords from the games in XJ1,2 and 3? I would like to have the pictures also as i can't seem to find any of them online. How about the more prominent ones? erm..... I'm not sure if there are any prominent ones.... maybe the seven star sword? The Sword mainly used throughout Paladin 3. Choosing to stay with the Demon Sword will save your sister, but you'll lose your love. Vice versa with the Monster Sword - it'll save your love, but you'll lose your sister. what is the 无尘剑? i nv got it.....xiaoyao has only got 3 swords? As far as I know i only got 3 swords for him, his father's sword (Long Quan Jian), the Qi Xing Jian (Seven Star Sword) from Jiang Ming, and the Qing Feng Jian from the dungeon (this one is hard to get). Btw why can't Ah Nu equip the Fong Min Sabre? And can you get the 纯阳剑 aft Xiaoyao wakes from dreamland? ryuko_hikaru wrote: what is the 无尘剑? i nv got it.....xiaoyao has only got 3 swords? 1. 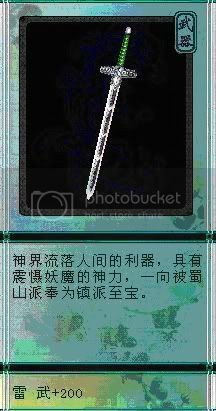 The sword Xiao Yao got from his father was originally the 青锋剑. But it got rusty so you have to repair it at the "Female-theif town". 2. The sword you got from the 8-floored dungeon (the one where you are suppose to collect 38 bugs, but you can go down to the lowest floor to learn the god summoning techs). The sword right in front of the last god tech portal is the 无尘剑. The best sword in the original Pal.